Common Unity Social Enterprise strongly believes that partnership working is the most effective way to achieving the best outcomes when delivering contracts, grant funded projects or training. 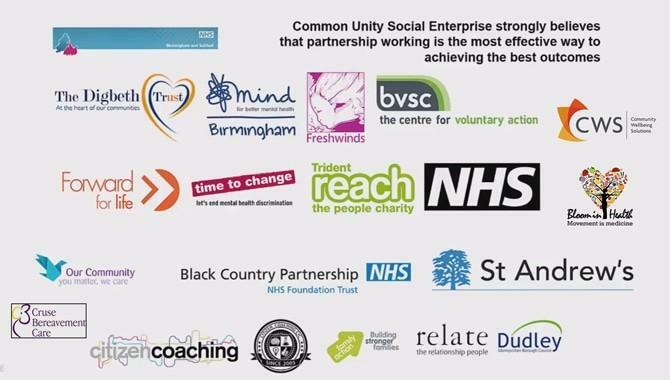 Partnership working has always played a key role in Common Unity’s successful portfolio, we have worked in partnership with a range of statutory, public, private and voluntary sector organisations locally, regionally and nationally. Our current portfolio for Birmingham and Solihull, known as the Connecting Community Networks Programme, provides a range of person-centred approaches to many of those in our communities that are vulnerable in respect of mental health, wellbeing and quality of life. The portfolio includes, through dedicated partnership working, peer support programmes for men known as ManMade, a range of suicide prevention training opportunities as well Urbrum, the online social media-based venture that highlights best organisational practice and community views regarding the health and wellbeing of citizens. In addition, we are the developers behind The Waiting Room, a highly respected online resource that supports people to support themselves when it comes to accessing support opportunities.